Corona and plasma treatment – when it is necessary to join plastics with metals or other plastics, printing, tag, varnish or glue on plastic, silicone, rubber, glass or composite surface, a successful outcome depends on the adhesion to the surface. Corona and plasma treatment modify surfaces (invisible to the human eye) and improve adhesion for many applications. The adhesion strength is dependent on a specific feature: surface tension or surface energy. Surface tension is measured in dynes/cm (mN/m) and is the determining factor for how well a liquid is sticking to a surface. 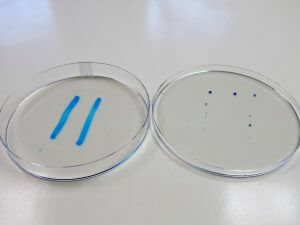 In order for a suitable adhesion to exist between a liquid and a surface, the surface tension of the material must exceed the surface tension energy of the liquid by 2-10 dynes/cm. The higher the surface tension of the solid material relative to the fluid, the better the wettability. (For more information about dune levels and materials, see separate diagram). Many plastics have insufficient surface energy for adhesion; polypropylene and polyethylene are examples of plastic materials with poor wettability. We have a wide range of equipment to solve most adhesion problems. Note how the ink on the treated side, left, adheres to the surface.